SHWETA TIWARI !!! Winner of BIGG BOSS 4. 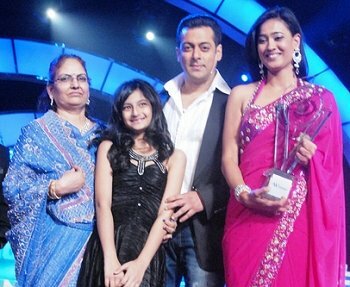 First female winner of Bigg Boss till now. Fight for the trophy and big money, one crore was between “The great Khali” and Shweta Tiwari. First Dolly and then Ashmit was out of the house. Bigg Boss 4 will be only remembered for Dolly and for me she is the winner, she should have been, but! Kaizad didn’t pump money to save Dolly. Baat yahi hoti hai khatam bas! So finally the ‘Diplomacy’ is winner of season 4. Now whatever it was, if being diplomat gets you 1 crore than why not? Loud mouth (Dolly), Lazy (Khali) and Physco (Ashmit) all tried their skills to win the show. Sameer Soni was awarded with Chevrolet Cruze car for being most Bold and Stylish housemate of Bigg Boss 4. Finale night opened with Salman’s dhamakedar, magnificent performance and as usual he was the “Best”. Salman was too cute. 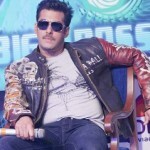 Hope he host Bigg Boss season 5. All the evicted contestants were present, looking great. Surprise was Seema Parihar, who was looking superb in pink sari and perfect makeup. Best part was the conversation between Manoj and Salman Khan. Salman rip Manoj off, again! Sara Khan and Aanchal Kumar – best performance. Sara khan performed on “Zor ka jhatka”. She danced and looked very good. 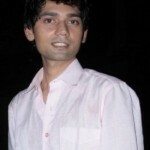 Hrishant performed on “I hate love stories and bachna ae haseeno”. Aanchal looked very pretty in her red dress, she performed on “Udi” from Guzaarish. Manoj Tiwari performed on “Tinku Jiya Ishq ka Manjan” song. Veena Malik dance on “Sheila ki jawani”. Shweta Tiwari gained popularity for her role as Prerna in Balaji soap Kasautii Zindagii Kay that used to air on Star Plus. She married actor Raja Chaudhary – who incidentally also appeared on Bigg Boss Season 2 and was 1st runner-up, without much success — and is currently divorced. The couple have a daughter named Palak. Still can’t belive that she won. i thought she will be 3rd or 4th person to leave the house. she was so boring, but “jab uperwala meharban to gadhi pahalwan”. Only Mango Dolly was the deserving contestants.